The What: TRENDnet has expanded its line of network video recorders (NVRs) with the launch of its new 8-Channel 1080p HD PoE+ NVR, model TV-NVR208. Later this year, TRENDnet will also launch three SMB-class NVR surveillance systems. The What Else: TRENDnet’s 8-Channel 1080p HD PoE+ NVR provides a comprehensive video display, storage, and camera management solution, ideal for home users or users with a basic surveillance setup. The TV-NVR208 standalone 8-channel PoE+ network video recorder allows users to plug and play up to eight TRENDnet PoE cameras, with concurrent 1080p HD video recording for all channels. Two 3.5-inch SATA II bays support up to eight TB of total storage (HDDs sold separately). Rackmount hardware is included. TRENDnet will further expand its NVR line later this year with three NVRs designed for advanced surveillance networks, providing a cost-effective solution that integrates with existing network hardware. Forthcoming models include the TV-NVR2432, 32-Channel HD NVR, with support for 32 TRENDnet cameras and up to 24TB of total storage; TV-NVR2216, 16-Channel HD NVR with support for for 16 TRENDnet cameras and up to 12TB of storage; and the TV-NVR2208, 8-Channel HD NVR, with support for eight TRENDnet cameras and 12TB of storage. 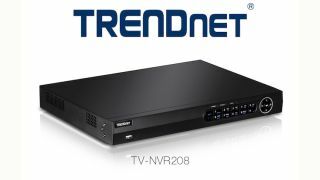 TRENDnet’s new 8-Channel 1080p HD PoE+ NVR, model TV-NVR208, is now available through authorized TRENDnet distributors and partners, with an MSRP of USD $314.99. The Bottom Line: The TV-NVR208 auto-recognizes and powers up to eight TRENDnet PoE cameras. Store up to three weeks of continuous video (with eight 1080p cameras at 30fps with medium VBR) with support for up to eight terabytes of total storage space.